I don’t know about you, but I love a good remote lighthouse, and the more inaccessible it is, the wilder the inevitable horror stories about it tend to be. Many years ago, while writing about Australia’s lesser-known islands, I visited Montague Island off the far south coast town of Narooma in NSW. Little more than a rock in a wild sea, Montague is justly famous for its fairy penguin and seal population, and its dramatic swooping birdlife. But what struck me most about the place was an incredible sense of foreboding, as though evil lurked here, only thinly disguised by the raw natural beauty of the landscape. The history of Montague didn’t really confirm my feeling about the place, although, like most remote lights, it had seen its share of tragedy. Soon after it was commissioned a young assistant keeper died an agonizingly-slow death after being trampled when a horse bolted. A few years later two young children of the lighthouse keeper died of suspected meningitis when steamer captains in the area refused the calls for help because they were afraid of attempting to land in rough seas. Closer to home, Double Island Point and Sandy Cape both also have a few good blood-curdling yarns, but none of them compares with the litany of death and disaster that surrounds the lighthouse I visited last week at the northern end of Bustard Bay, which stretches around almost 30 kilometres of wild country and deep inlets from the Town of 1770. Commissioned in 1868 as the first lighthouse in the new state of Queensland, the Bustard Head Light was one of the most remote in Australia, accessible only by shallow draught boats and drays pulled by horses. A century and a half later, it isn’t much easier to get to, requiring a seriously tough 4WD with plenty of clearance and an exceptional knowledge of local tidal factors. In my younger days I would have been all over that, but last week I took the soft and fun option of taking the LARC tour out of 1770, but more about that later. Tragedy struck at Bustard Head even before the prefab light was completed, when a workman was struck on the head by a steel rod and died within hours, thereby establishing a long tradition at Bustard: if something goes wrong, chances are you’re dead. Early lighthouse keeper Nils Gibson’s bad run started in 1887 when his 49-year-old wife Kate was found by her teenage daughter propped up against a tree with her throat slashed ear to ear. Nils was conveniently camped some kilometres away that night and when he returned he discovered one of his cut-throat razors hidden in a nearby tree root. The death was ruled a suicide and Kate was buried in a tiny fenced graveyard near the light, where she soon had plenty of company. Not quite two years after Kate’s death, Nils, his 20-year-old daughter and two others set off from Bustard in a sailing boat. Although there is no indication that the seas were particularly rough, the boat soon capsized and only Nils made it to shore alive. His daughter’s body was never found. All this excitement took its toll on the keeper of the light, who took solace in the rum bottle and died of cirrhosis of the liver a decade later and was buried next to his family. In the new century the Bustard Light was back in the news when an 18-year-old Indigenous boy named George Daniels was accused of murder and kidnapping after the disappearance of Edith Anderson, the lighthouse keeper’s daughter. Apparently Edith had become involved in a love triangle with Daniels and Arthur Cozgell, the son of a station owner on nearby Middle Island. Cozgell and Edith were riding on horseback towards the Bustard Head crossing when they were attacked. She was abducted and Cozgell shot in the chest. With his dying breath Cozgell was said to have identified his murderer in the unfortunate parlance of the times as “that black bugger”. Despite the most expensive police search mounted in Queensland to that time, Daniels and Edith were never found. The Bustard Light was automated in 1986 and tragedy of a different kind overtook the hilltop settlement. Over the next 15 years the abandoned buildings (rebuilt in 1935 after fire took the originals) were vandalized by lowlife visitors to such a state that the government wanted to bulldoze what was left. 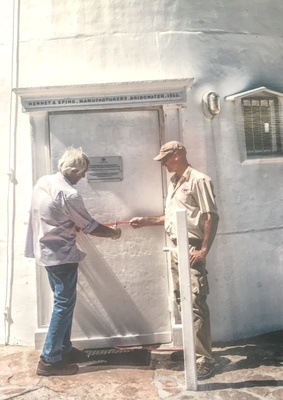 Enter former Bustard keeper Stuart Buchanan who in 1999 published a history of the light called Lighthouse of Tragedy, drawing attention to its heritage values and the need to protect the historic light. 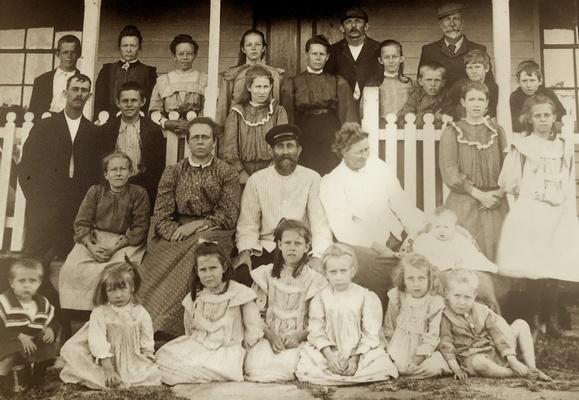 In 2002, with the help of wife Shirley and the entrepreneurial Mergard family from Agnes Water, he formed the Bustard Head Lighthouse Association, and restoration began. 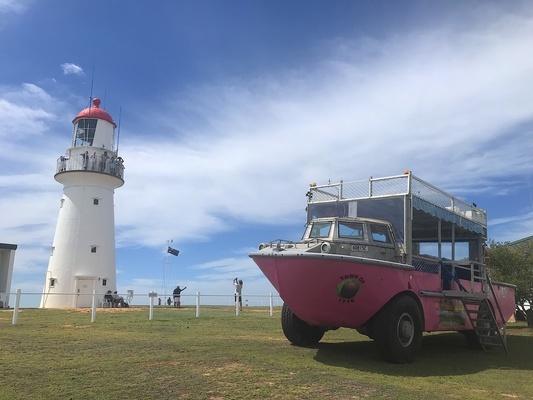 Today Neil Mergard owns and runs the highly successful 1770 LARC Tours, offering three full-day tours to the now-pristine Heritage-listed light each week, crossing rivers and making light work of soft sand in his hot pink mid-1960s Lighter Amphibious Resupply Cargo vessels. A fascinating piece of history themselves – fewer than a thousand were built and they were primarily used by the US Army in Korea and Vietnam – the LARCs tread lightly on the fragile landscape. The Bustard tour is a great mix of ecotourism, history, local culture and, well, murder and mayhem, with a dash of fun chucked in. Hey, I had my first go at sandboarding a 40-metre dune since Neil’s LARCs were coming off the production line, and I loved it!